What do you do if you put your horse on a very strict diet to control his weight but he is not getting any thinner? You swear he is getting fat on air, but more than likely your horse has found a way to get around your efforts. Your horse is probably sneaking treats when you are not looking! While the short dead grass in the turnout paddock looks like it can’t possibly have any calories, the grass roots may actually be loaded with sugar. When grass is stressed by drought or frost it produces extra sugar, especially near the roots. The fall is a hard time to control weight on a pasture pony because nature tries to provide a bounty of high-calorie foods to fatten up the wildlife for winter. Many times owners tell me that they have oak trees, but they never see the horses eating acorns. Trust me, the horses are munching on acorns or the ground would be covered with them. Squirrels can only eat so many. Your horse is probably snacking when you are not looking or late at night. Those scrubby-looking flowers and leafy weeds can be high in calories. Many weeds like dandelion and thistle are very tasty to horses, and even though they are average in sugar content the calories can add up if your horse eats a lot of them. Corn syrup or dextrose may be added to formulated supplements to make them taste better. Read the labels. Food-based supplements such as aloe and slippery elm are both high in carbohydrates, so when these products are needed cut back slightly on other feeds. If your horse constantly begs for horse treats, learn to look the other way. Horse treats are the equine equivalent of cookies and candy, and should be strictly off limits for overweight horses. Offer your horse a carrot or special low-carb treat instead. Is your horse still overweight despite the fact that he is definitely not finding any extra treats, is getting some kind of exercise, and is being fed between 1 and 1.5% of his body weight? If so, you will need to consider hormone imbalances. A cresty neck or extra fat around the shoulders and tail head can be indicators of insulin resistance. 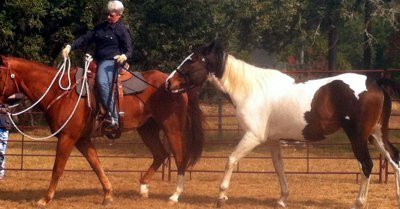 These horses need very tightly controlled diets and mineral balancing to control insulin levels. Never feed any horse less than 1% of his body weight. If you horse acts hungry all the time there is a good chance he is not getting all the nutrients he needs. He will need fewer calories, but more nutrient-dense food such as alfalfa or blue green algae. Fat is also a necessary part of every horse’s diet, but most vegetable oils have only empty calories. Chia seeds are a great source of fat for the overweight horse. They provide a wonderful balance of fatty acids and have a good mineral profile for the horse. A quarter cup a day of these seeds will be plenty for most horses. For a horse dieting can be just as frustrating as it is for people. After all they love to eat just like we do. Extra exercise will work off calories so you can feed some occasional treats or skip the diet for a day. An hour of steady exercise will even keep insulin levels under control for 24 hours. If you don’t have time to ride, consider leasing your horse out to someone who can work him or set up his paddock so he has to cover plenty of ground to get to salt and water. Good luck and don’t give up! If your horse isn’t just on a diet but actually has insulin-resistance, Cushings, or laminitis, then you will probably need to buy special feed and supplements designed especially for your horse. You may also want to consider different ways to manage your horse, such as structuring your paddock differently, so that your horse remains happy, even on a special or limited diet.